Anyone who loves Modernism knows Pierre Koenig's houses. They're rational, beautiful, glamorous statements of the free-wheeling California life. Touring a Koenig house, one can be forgiven for thinking that one has somehow walked into a marvelous Sixties movie; it's easy to imagine Matt Helm living in one of these glass-and-steel masterpieces, or maybe Peter Gunn. In such high-style surroundings, images of Cary Grant romancing Audrey Hepburn are not hard to conjure up, either- so it comes as something of a surprise to find that Pierre Koenig's work has just as much substance as style. Koenig's work is so fresh it is hard to remember that his practice goes back half-a-century, to a time just after World War II. While still a student at USC's School of Architecture, Koenig did something very few students get to do: he built himself a house. Not just any house, either- it was an elegant glass-and-steel pavilion that attracted nationwide attention. At one stroke, Koenig established himself as a force in Modernist architecture; the echoes have not died down yet. Following Koenig's graduation in 1952, he began a practice that gained an enormous following. His houses captured the spirit of the post-war boom like no others; their open plans, easy glamour, and ease of maintenance were exactly what Los Angelenos wanted to chase the austerity of the war years. Koenig was in demand, immediately and continuously. He might easily have ended up with a roster of celebrity clients who wanted houses that looked good in Photoplay magazine layouts, as did Cliff May. He did attract one celebrity commission, in fact: actress Jean Hagen and her husband Tom Seidel were Koenig clients who asked for both a main residence and a beach house. If Jean Hagen's name rings a bell, it should; she played the uproariously funny silent star 'Lina Lamont' in the MGM classic 'Singin' In the Rain'. Actor Seidel was not the star his wife was, but he had another side to his resume; he was also a builder, and so he put up his own Koenig houses, and some others as well. More Hollywood clients like these could have occupied Koenig most profitably, but the architect had other plans, and they began coming to pass in 1957, when 'Arts and Architecture' approached him for two houses to be built as part of the magazine's Case Study House program. Why Do Fools Fall in Love? Strangers When We Meet Galaxy Quest First Power 13th Floor Playing It By Heart Marrying Man. Hollywood loves Pierre Koenig! His houses have been used in many films. Maybe you can't buy the house, but you can rent the movie. Begun in 1945 by 'Arts and Architecture' publisher John Entenza, the Case Study program eventually encompassed thirty-six houses; Charles and Ray Eames, Richard Neutra, Craig Ellwood, and Koenig were just a few of the participating architects. 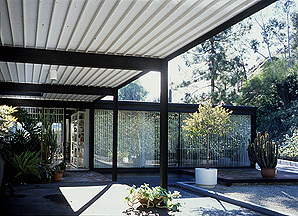 Although a few Case Study designs were never built, the majority were, including two by Koenig; Case Study Houses 21 and 22. Every Case Study house was innovative, exciting, and seemingly a direct window into the future, but Koenig gave even more to the program than the other architects did. His first five years of practice had given him tremendous experience with Los Angeles' hilly terrain and arid climate; he was already adept at siting houses so they took advantage of breezes and blocked out the worst of the sun. He was about to do much more. CSH 21 (1958) Case Study House 21, designed in 1957, was built to take advantage of what was then considered an unbuildable lot. Koenig's first decision was that the house would dispense completely with the traditional program of driveway, lawn, landscaping, and impressively set-back house. The site plan allowed for a few feet of driveway terminating immediately in a carport that also sheltered the entrance; the street facade was geared toward the privacy of occupants, not the gratification of status-seekers. Only those permitted inside the discreet front door got to see what Koenig had accomplished where no one else wanted to build; a world of shelter, comfort, and style. Not terribly large, the house offered a sense of freedom, tranquility, and respite not easy to find in L.A.. Koenig's plan floated the house over its lot; expanses of glass made a stunning view part of every room. As handsomely sleek as CSH 21 was, it had much more than style; there were surprises at every turn. One of the biggest was the house's sympathy with the prevailing climate; it was oriented to trap sun in the winter and shade it out in the summer. Another surprise was that a microclimate had been created around the structure, by the use of shallow reflecting pools; the pools aided the house and its grounds by providing evaporative cooling in the dry Los Angeles climate. The cooling effect was aided further by pumping water from the pools to the roof, where it was allowed to fall back to the pools through roof-level downspouts. Although Koenig, by his own admission, was not as aware of environmental issues in 1957 as he is today, his instincts served him well. Like virtually all Koenig houses, CSH 21 was built without air-conditioning; none of the house's various owners have seen fit to add it, no matter what other changes have been wrought in Koenig's work. CSH 21 is highly unusual among modernist masterworks in that it has been treated to a comprehensive restoration at the hands of its original architect. For once, a restoration has brought a famous house back to its precise original intent; there has been no guesswork and no improvisation. Koenig's reworking of CSH 21 was so meticulous it took twice as long as the original construction. The kitchen is especially noteworthy; Koenig's original design had been largely replaced with a renovation unsuited to the house, necessitating a gutting of the space. Since today's materials and appliances are very different to those available in 1958, the architect painstakingly re-interpreted his original plan to accommodate them. The result is a crisp, sleek galley that sticks to the original plan without hinting at a re-creation of the 1950's. CSH 21 embodies many principles that have become paradigmatic in Koenig's work; the sympathy with the climate, the creation of a microclimate, and above all, the reluctance to create a house dependent on mechanical systems. Pierre Koenig's view of mechanical systems is that they will- sooner or later- fail, and that a house should not rely on them for its survival or that of its inhabitants. This by no means indicates that Koenig is uncomfortable with technology; it simply shows that he is a supreme realist. It's interesting to compare CSH 21 with another glass-and-steel house of equal fame, Mies van der Rohe's Farnsworth House. As beautiful as Farnsworth is, Mies cared nothing for the climate; the house is a unshaded glass box in a sunny meadow, and it was sweltering indeed before its present owner fitted an air-conditioning system. CSH 21's glass walls slide largely open for ventilation, and cross-ventilation has not been neglected. CSH 22 (1960) CSH 21 has known fame and acclaim since it was first built; it was followed by CSH 22, a house on an even more 'unbuildable' lot. Where CSH 21 offers a feeling of connection to the hillside on which it was built, CSH 22 is about exhilaration; it hangs off its crag in a manner that hints of danger, while being perfectly safe- indeed, more stable in earthquakes than many of its neighbors. In recent years, Koenig has become even more adventurous; his recent Schwartz House handles its problem lot with stunning simplicity. In designing this house, Koenig was faced with a lot that was squared with the street, but whose best view was to be seen thirty degrees to the southwest. The lot was too small to permit a house set at an angle on the property; the project had to be built nearly to the lot lines to get the square footage needed by the client. Koenig's solution was to build a steel frame squared with the lot lines, and then to place another steel frame inside the first, twisted thirty degrees toward the desired view. In the 'USC Chronicle', writer Carol Tucker has described Schwartz as looking something like a gigantic Rubik's Cube; she's exactly right. Koenig has come full circle; USC's wunderkind of 1952 is still there today, but now he teaches tomorrow's architects how to create architecture that is beautiful, durable, and respectful of the limitations of nature. One of Koenig's mantras is the importance of microclimates; students are told repeatedly to become familiar with climatic conditions on a building site, and to design for what actually exists there. Koenig refuses to allow anyone- students or himself- to repeat stock ideas; every project is a law unto itself. CSH 21 is an excellent example; its reflecting pools work beautifully in the Los Angeles climate to cool the house. The idea would be unusable in Florida or Georgia, where humidity is high; the pools would become stagnant, becoming a danger and discomfort to the house and its occupants. Students are given everything they need to learn how to site a house and to take full advantage of the microclimate surrounding it. One such tool is the heliodon, which simulates the fall of the sun onto a model house in every season, at every latitude and longitude. Students can see very clearly the need for refinements to their projects, based on what they observe the artificial sun doing to their designs. An overhang may need broadening to shield against summer sun; a window may need to be enlarged to get more solar gain in the winter. Shake tables give data on how designs will behave in earthquakes and aftershocks; Koenig's designs are famed for standing serenely during temblors that level other houses nearby. A wind tunnel can suggest ways to improve air flow through a model; cooling breezes are neither incidental nor accidental in Koenig's view. As if Koenig's practice and teaching loads were not enough, he is a tireless lecturer and speaker, working with gusto to spread his views on what he terms 'sustainable architecture'. He tells the crowds he draws at MoMA and Arizona State and Yale that is possible to give man great comfort without dependency on failure-prone, energy-intensive heating and cooling systems. Koenig does not want climate controls; his message is that the climate should be managed. The next time you see one of Koenig's houses- or one of the timeless Julius Schulman photographs- you now know their greatest secret. They have style in abundance, but they are really not about that at all. They're about Earth serving mankind, and mankind respecting Earth. That may be the most stylish notion Pierre Koenig ever had. (c) 1999, 2000, D.A. "Sandy" McLendon and Joe Kunkel, Jetset - Designs for Modern Living. All rights reserved worldwide. This article may not be reproduced, reprinted, reposted or rewritten without express permission in writing from the author and publisher. First posted to the Web on September 9, 2000.